Salem is a beautiful city about an hour's drive south of Portland depending on the traffic and time of day. My GPS routed me through rolling hills of fall colors, farmland, vineyards and past Klamath Falls. 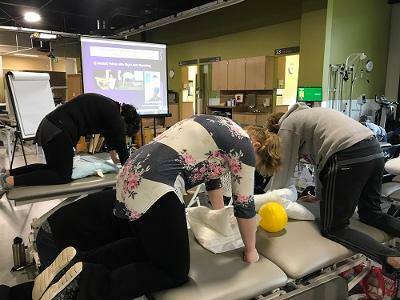 This course was hosted at Salem Health in their new rehab facility which is so busy that they are outgrowing the space just two years after construction. The facility is state-of-the-art with large windows looking at trees turning fall colors outside with green everywhere you looked. The real show was the participation of the students that had diverse professional backgrounds that included physical therapy, chiropractic, athletic training, strength and conditioning and massage therapy. There were five athletic trainers that represented two teams from major league baseball and their questions came in fast, accurate and intelligent with no curve balls! Members of the rehab team from Salem Health represented their facility by not only providing this venue but bringing energy to the whole weekend. Shout out to Mark Kucey for his recipes for an autoclave and his engineer mind with restates and questions. In fact, this entire group of students was quick with restates and questions that mattered to the rest of the class and lifted everyone's game including this faculty member! Huge kudos to lab assistant Tina Haiser, DPT, PRC and super Lisa Davis, PTA for doing the behind-the-scenes hard work of food, signing people into the course and making the weekend run smoothly for all involved. Every course can use more time in lab is a general consensus. This weekend was no exception however lab time was ample enough to give everyone a chance to be introduced to and practice the Three Big manual techniques including L AIC, Superior T-4 and Subclavius release. The demonstration for determining if a patient is a Superior T-4 Syndrome individual went very well considering the subject is a running coach and sees this issue in all of her patients. It was a first time for her in Postural Respiration and as a side note after the technique was demonstrated on her, she experienced a change in her neck symptoms and cuboid symptoms as well for the better. Needless to say there was no shortage of enthusiasm from the entire group and in short it was a faculty member's dream team of diverse professions sharing a common goal to help others while expanding their knowledge. One of the questions that came up is if an athlete has a pattern they rely on for performance will introducing a new pattern affect their performance? We don't want to take anyone's performance pattern away. We simply want to give them a place to find and feel new places to go in their body to rest, recover and restore.